If your inboard goes belly up, you’ll need to know the three Rs. Marine engines used to break down all the time, but today’s motors—gas, diesel, and outboard—are very reliable. Maintain them according to the manufacturer’s schedule; don’t run them throttles-on-the-stops all the time; keep them from overheating; and feed them clean fuel. Do that and today’s engines will most likely run for hundreds, maybe even thousands of trouble-free hours. But everything mechanical, including your engine, has an Achilles’ heel, and someday you might discover what it is. When you do, you’ll need to know the three Rs of engine rehabilitation. They say good things come in threes—the wise men; the Stooges; “All Gaul is divided into three parts”; the Niña, the Pinta, and the Santa Maria, etc. And there are three ways to deal with an engine that’s seriously under the weather: repair, rebuild, or remanufacture. (OK, there’s a fourth R, too: repower. We’ll address that in a future column, but for now, let’s deal with only three.) What does each term mean, when applied to an engine? Repair is simplest to explain—everybody understands the concept. It entails everything from replacing ancillary systems—starter, alternator, water pump, etc.—to fixing an oil drip from a faulty valve-cover gasket to replacing a corroded exhaust riser or manifold. 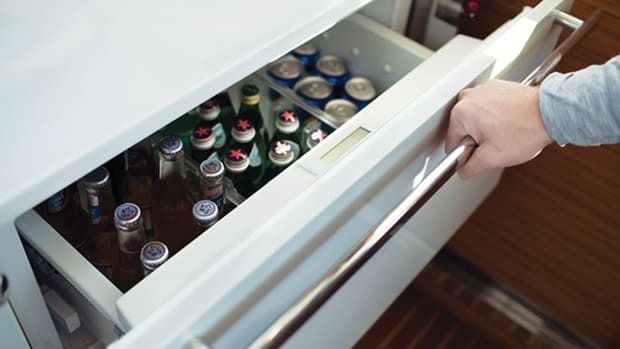 Simple stuff that’s one step beyond maintenance. Repairs can run up a lofty tab, but a good mechanic can deal with most of them while leaving the can of worms securely sealed. If the guts of your engine are good, if it’s not burning lots of oil or guzzling more fuel than it used to, and still has plenty of get up and go, then repairs are usually worth the expense—and cheaper than the alternative. But if something goes awry inside the engine, you’re looking at a rebuild. Rebuilding involves taking the engine out of the boat (not always easy), breaking it down, repairing the problem, cleaning all the usable components, and putting the engine back together using a mix of old and new parts. (Partial rebuilds, like replacing a cylinder head, can be done in situ, and some diesels can be completely rebuilt in an engine room, but in general, rebuilding means the engine’s coming out.) Rebuilding is done in the boatyard machine shop, by mechanics you can speak to in person so you can find out what’s going on. When the work is finished, your old engine goes back into your boat (not always easy, either), and you’re handed a hefty bill. You’d think boatyards would love rebuild jobs, but that’s not always the case; more on that in a minute. Finally, there’s remanufacturing, the next best thing to repowering, or buying a new engine. Remanufacturing happens at a factory, where used engines are completely torn down, thoroughly cleaned, inspected, and reassembled to factory specs, using many new parts. 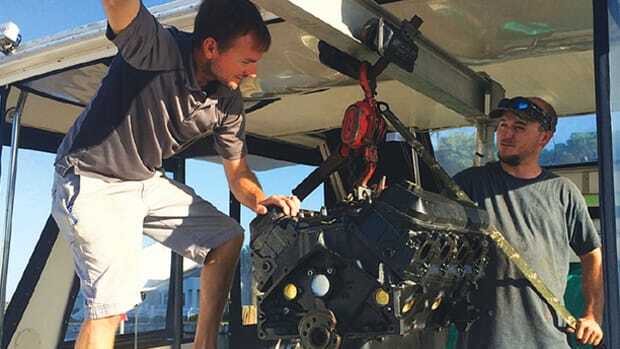 When you buy a remanufactured marine engine, you don’t get a complete, ready-to-install engine, but a “long block,” which consists of the engine block, crankshaft, cam, pistons, and related parts—what gearheads call the “rotating assembly”—and cylinder head or heads. (A “short block” doesn’t include the cylinder heads, but if you’re going this far, you want a new head or heads, too.) No exhaust or intake manifolds are included, no fuel-supply system, no ancillary items like the starter, alternator, etc. Your mechanic either takes those off your old engine, or you buy them separately. Some remanufacturers offer a “tinware” package consisting, usually, of the oil pan, timing cover, and valve covers. 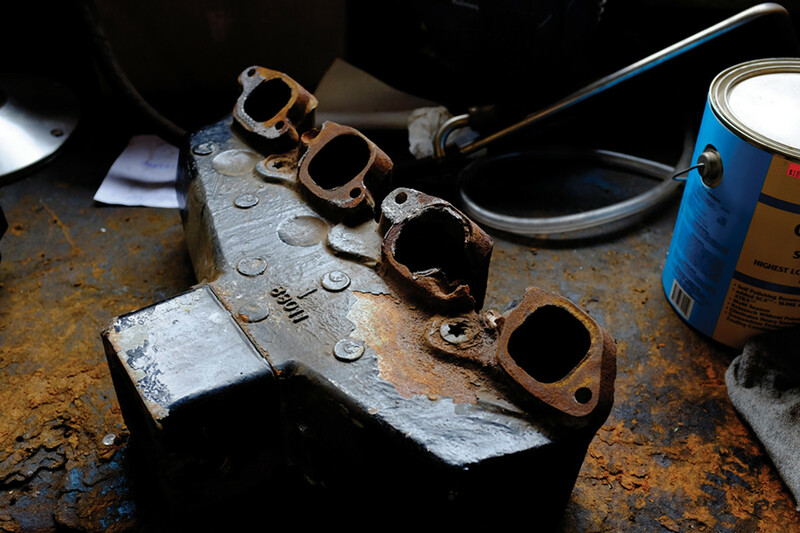 Petzold’s Marine Center has encountered all kinds of worn-out engine parts. Bob Petzold is one boatyard man who defenitely does not want to rebuild your engine. “It’s cheaper to replace it,” he says. Petzold is the president of his family’s boatyard, Petzold’s Marine Center (www.petzolds.com) in Portland, Connecticut. His mechanics are qualified to work on almost every brand of marine engine, and they’re happy to repair yours. But when it comes to rebuilding, explains Petzold, there’s so much labor involved—it takes hours for even a skilled mechanic to do everything that should be done once the engine is opened up—“it doesn’t make sense, unless you’re going to do the work yourself.” Petzold says he can usually get a remanufactured engine in a couple of days, and often can have a customer back on the water without missing a weekend. That’s big in New England, where the boating season is short. 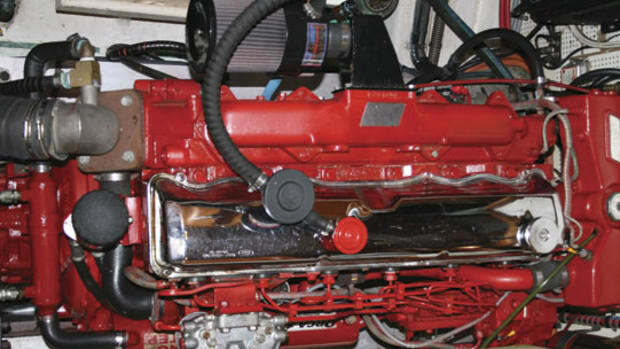 There are several reputable remanufacturers of marine engines, and they’re easily found through a Web search; look for “rebuilt marine engines” or “remanufactured marine engines.” Most have thorough sites that explain the process in detail, including which methods are used to clean and test the components, what parts are replaced or reused, and so forth. Typically, a remanufactured engine has lots of new parts—pistons, bearings, valves, pushrods, maybe the camshaft and timing gear, plus all seals and gaskets. The blocks, heads, crankshafts, and connecting rods are thoroughly cleaned, inspected and machined to exact tolerances, the cylinders are re-bored and honed to exact specifications, and the engines are live-tested after assembly. 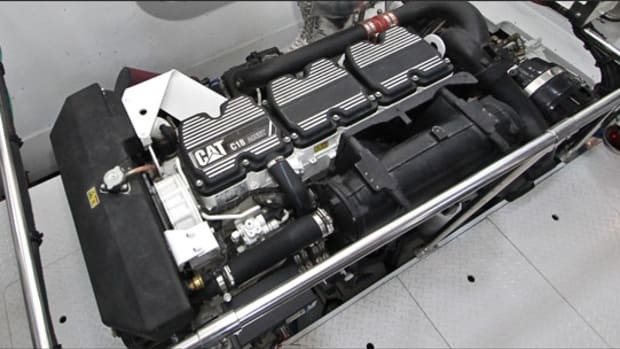 While your engine’s still healthy, reread “How to Make Your Boat’s Engine Last Forever”. You’ll find good advice about, well, making your boat’s engine last forever by adhering to a rudimentary maintenance program. Following the story’s advice, especially about oil changes—that is, making sure all the old oil is drained out—will slash your risk of having to deal with premature engine failure. Fresh lube oil and clean fuel are meat and potatoes to an engine. Most remanufacturers sell only to licensed mechanics, not to the general public. 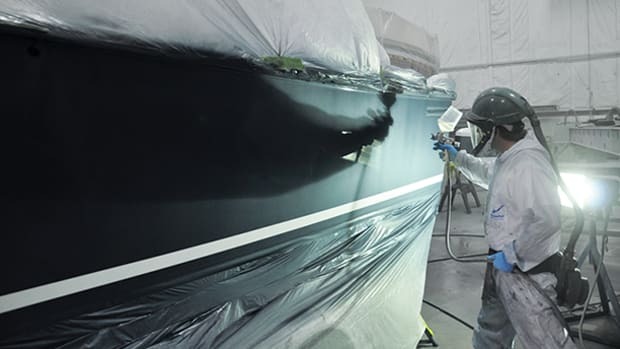 Since there’s a lot of work to be done to the long block before it’s ready to install in a boat, a skilled mechanic is needed to finish the job. And there are warranty issues, too. 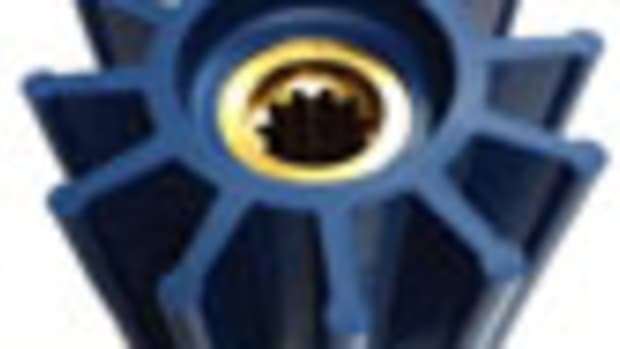 Typically, a remanufactured engine is covered for 18 months, maybe two years, and the supplier wants to be sure the engine is finished and installed correctly. But not all warranties are alike, so closely reading the warranty is important when buying a remanufactured engine. For warranty work, chances are you’ll be required to pay the yard for replacing a defective engine, and the remanufacturer will then reimburse you; hourly rates and maximum allowances for labor varies. Petzold likes buying from Mercury Marine (www.mercurymarine.com), partly because of the warranty. There are Mercury dealers everywhere, he says, so if you have a problem chances are good there will be one nearby. Mercury Marine will also refurbish MerCruiser engines at the same factory where they were built in the first place, using MerCruiser OEM parts. They are sold as long blocks, but Mercury also sells certified pre-owned engines, complete packages ready for installation, also remanufactured at the Mercury factory. And then finally, you don’t have to go through all the drama I’ve just described, according to Petzold. 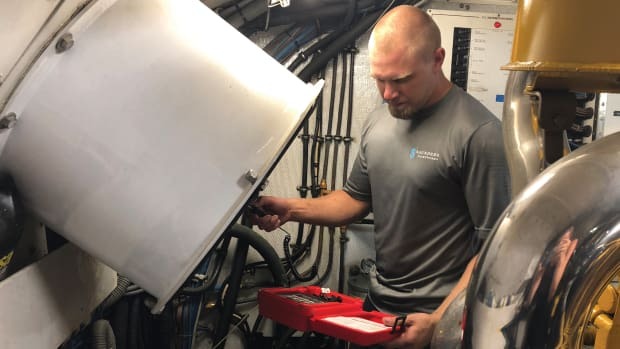 Most engines today will go 1,000 hours with just routine maintenance, he says, especially if you take the time add a fuel treatment to the tank every time you fill up—a stabilizer for gasoline, a biocide for diesel. “About 95 percent of the engine problems we see are due to lack of maintenance,” he says, and most of them are closely related to failed risers and manifolds. 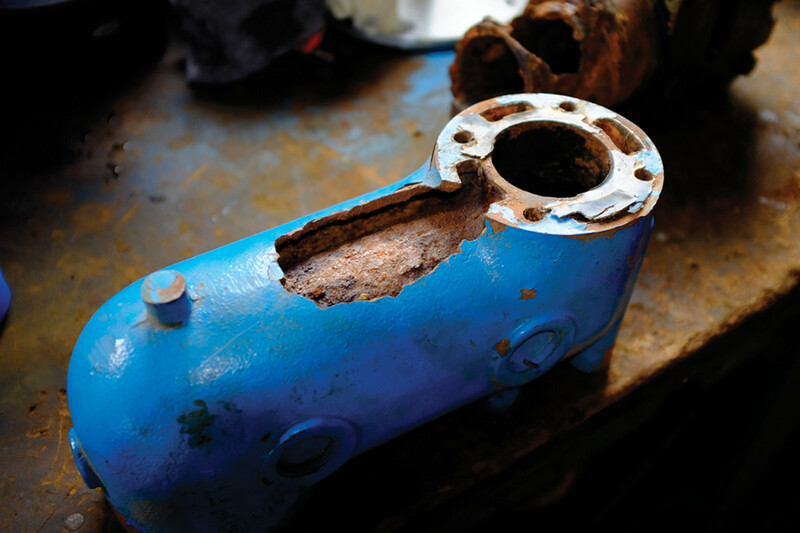 Petzold recommends replacing saltwater-cooled risers and manifolds every five years at least. There’s no doubt that this can be expensive. But check with your mechanic to develop a schedule anyway. Yeah, we know you hear stuff like this all the time (see “Breathing Easier”), but spend an hour with Petzold and he will make you a believer. The man is the curator of his own collection of twisted connecting rods, cracked pistons, rusted-out manifolds and risers—bits and pieces of engines that died early deaths due to poor maintenance, many of them due to water getting into the cylinders through a rusted-out exhaust riser or manifold. 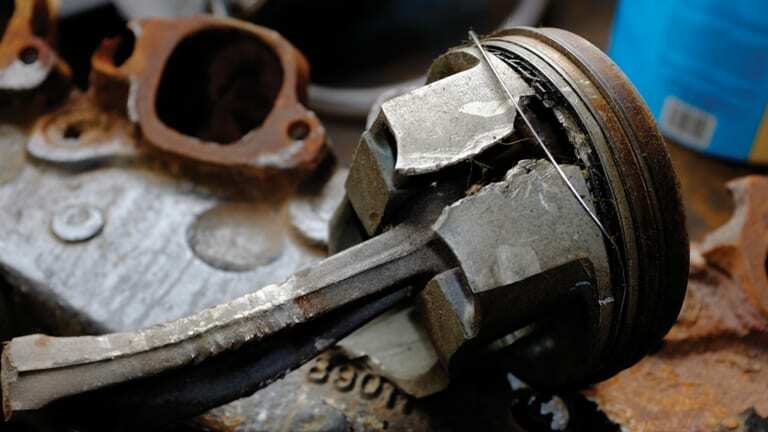 Crank the starter on an engine with water in a cylinder, and the laws of hydraulics do the rest, bending a connecting rod or cracking a piston. Whatever happens, it ain’t good. The bottom line? Keep your engine maintained, and your exhaust components in good shape.